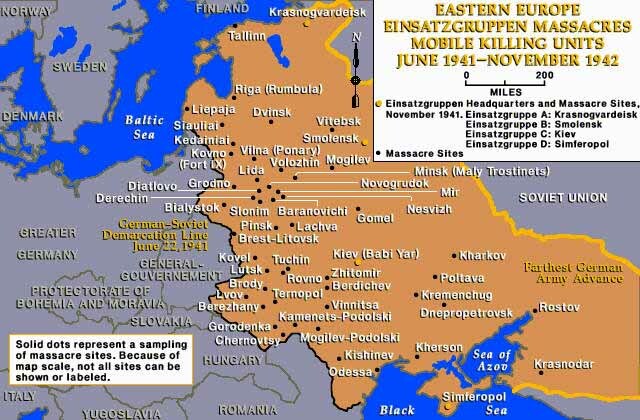 After the German army invaded the Soviet Union on June 22, 1941, a new stage in the Holocaust began. Under cover of war and confident of victory, the Germans turned from the forced emigration and imprisonment of Jews to mass murder. Special action squads, or Einsatzgruppen, made up of Nazi (SS) units and police, moved with speed on the heels of the advancing German army. Their job was to kill any Jews they could find in the occupied Soviet territory. Some residents of the occupied regions, mostly Ukrainians, Latvians, and Lithuanians, aided these German mobile killing squads by serving as auxiliary police. The mobile killing units acted swiftly, taking the Jewish population by surprise. The killers entered a town or city and rounded up all Jewish men, women, and children. They also took away many Communist party leaders and Roma (Gypsies). Victims were forced to surrender any valuables and remove their clothing, which was later sent for use in Germany or distributed to local collaborators. Then the killing squad members marched their victims to open fields, forests, and ravines on the outskirts of conquered towns and cities. There they shot them or gasses them in gas vans and dumped the bodies into mass graves. The killing squads murdered more than a million Jews and hundreds of thousands of other innocent people. At Babi Yar, near Kiev, about 34,000 Jews were murdered in two days of shooting. Only a few people in the general population helped their Jewish neighbors escape. Most people were afraid that they too might be killed.